Just as the curious Cow meanders through pastures of grass, we too are curious about the world around us. 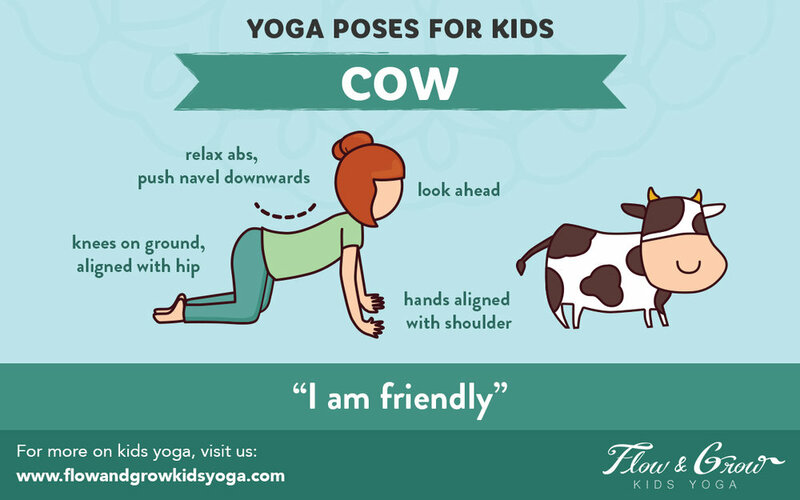 When breaking down this pose for kids, we like to talk about this peaceful animal. Not only are cows peaceful and curious, it turns out cows have best friends! Cows tend to form friendships within herds and are always curious to make new friends. When discussing this pose with kids, we like to talk about friendship! What makes a good friend? What do you like most about your best friend? Ages: All ages. Appropriate for toddler and preschoolers too. For additional modifications of this pose, draw circles with your neck. Or make loud chewing sounds like the cow as a breathing exercise! As you inhale, lift your chest and tailbone toward the ceiling. Let your belly relax towards your mat. Raise your head up. Press down into your knees and hands so you feel strong and supported. Act like a cow while in the pose! How loud can you moo? Talk about friendship. What makes a good friend? What do you like most about your friend? Craft time! Make friendship bracelets. For added fun, add Cow beads. DONATE: If you found our resources helpful, please consider a donation!